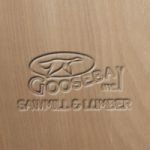 Okoume Marine Plywood - Goosebay Sawmill and Lumber, Inc.
Okoume Marine Plywood, which is sometimes referred to as Gaboon Marine Plywood, is a BS 1088 Lloyd’s Register rotary-cut plywood. It is suitable for marine applications and boat building. It is lightweight, flexible and has good strength. It is often used to sheath kayaks. We can order okoume plywood in 4 X 10 foot sheets. Availability varies: please contact us if you are interested. Minimum order is usually one sheet.